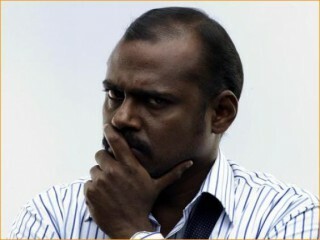 Pasupathy is a Tamil film actor. He has appeared in a several critically acclaimed roles in many noted Tamil films, also known as Kollywood. He got his major recognized role in Kannathil Muthamittal where he played an LTTE cadre. He then worked as a villian in a number of films such as Thirupachi as 'Pattasu Baalu', Dhool as Aadhi, and Virumandi. He later branched out into comedy (Mumbai Express) and in supporting role in Raman Thediya Seethai. He has acted the lead in films, such as the well-received Veyyil and Kuselan. He bagged the best villian filmfare award for the year 2004 for Virumandi beating his counterpart for Dhool. He is married to Geetha Mohandas who once worked as a Ground Staff of Indian Airlines. He has two children, a son and a daughter.